The middle-income trap kills, and one needs to look no further than in the slums in Latin America. 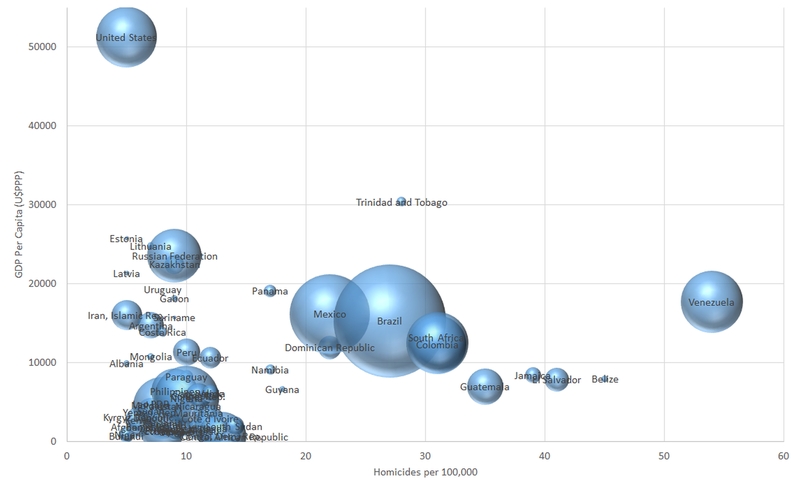 We do not know all the reasons why some countries are more violent (measured by homicide rates) than others. What we do know is that rich countries are invariably safer than poor countries, but that poor countries are not born alike. Murder rates are sky high in Latin America, yet low in Southeast Asia. Being richer in South America does not translate into lower murder rates, as Brazil’s is more than twice the rate of poorer neighbors such as Ecuador, Paraguay, Colombia, and Peru. The highest murder rate in Africa is not in a country ravaged by civil war, but in democratic South Africa. Honduras is by far the most violent country in the world. 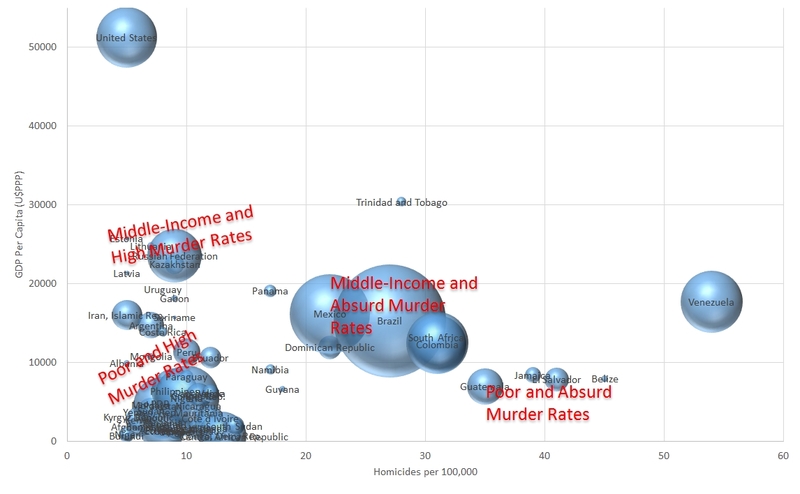 The difference between the murder rate in Honduras (92 per 100,000 people) and the second most violent country in the world, Venezuela (54 per 100,000 people) is so large that I chose to take the country out of the graphs representing correlations between homicides, GDP per capita, and income inequality. Latin America concentrates most of the world’s homicides. Brazil is the country with the highest absolute number of homicides in the world (more than 12% of the world’s murders happen in the country). Over a quarter of murders happen in either Brazil, Mexico, Colombia or Venezuela. Homicides other than crimes of passion affect almost exclusively poor people. Rich people are generally safe anywhere in the world, even in high-murder countries. To show data comparing countries around the world, I chose to restrict it to countries with at least 5 homicides per 100,000 people. Data come from the World Bank, for the most recent year. Circle sizes indicate absolute number of homicides. First, we can see that rich countries simply do not show up in the data, with exception to the United States. We can easily divide countries in four highly homogeneous groups. Poor and High-Murder Rates: Countries with murder rates in the 5-20 homicides per 100,000 people. All countries are from Latin America and Africa, with the exception of the Kyrgyz Republic, Iran, Mongolia, Moldova, Laos, Yemen, and the Philippines. Middle-Income and High-Murder Rates: All are part of the former Soviet Union. Poor and Absurd Murder Rates: Some small countries from Central America. Middle-Income and Absurd Murder Rates: Mostly large emerging countries, all from Latin America, with the exception of South Africa. Exceptions are Honduras and Venezuela, both with almost incomprehensible homicide rates, and the aforementioned case of the United States, the sole representative of the rich world in the sample. We know that inequality by itself cannot explain crime rates, even though it is one of the main explanatory variables in the criminology literature. For instance, Fajnzlber et al (2002) present a convincing empirical estimation of the causation of inequality on violent crime. More examples here, there and everywhere. For the present sample, we can clearly see a relationship between inequality and murder rates. With very few exceptions, higher inequality is correlated with more homicides. The large emerging countries that concentrate much of the homicides in the world are all highly unequal societies. Of course, we do not have in the sample above countries that are unequal but have homicide rates of less than 5 per 100,000 people. Of the 130 countries with data on all dimensions, Chile has the highest Gini Coefficient (50.5) for a country with less than 5 homicides per 100,000 people. For the whole sample, correlation between GDP and murder rate is -0.26 and between murder rate and Gini Coefficient a significantly high 0.54. Inequality kills, and getting richer saves lives. Homicides claim almost 500,000 lives per year, concentrated in a few countries. There are no easy solutions for this daunting issue. Even though it affects mostly poor people, the sense of security is justifiably lower in countries with high homicide rates. On a personal note, my uncle was killed in a carjacking in Rio 20 years ago, and a dear friend from NYU Shanghai was shot, but thankfully not killed, in a drive by in New York City. I should note that there is a huge gap between perception and statistical reality. Richer people are safer in poor countries. Inequality is far from only a moral issue. Decreasing it may save lives. We have a duty to fight it, and ideas like universal basic income may generate positive externalities far beyond what we think it can achieve. This is why, for poor to middle-income countries, even though basic income is not possible yet, cash transfer programs, an antecedent to basic income, are popular and effective. We already know that a conditional cash transfer program like Bolsa Familia is responsible for lowering crime rate in Brazil. Of course, basic income should not be enacted solely because of its effect on crime rates. We need a more comprehensive approach, and there are no general policies that will lead to lower homicides in Latin America, in particular, and the world, in general. For instance, some models indicate that simple measures of gun registration could lead to lower homicide rates in the US. A comprehensive approach needs to go much further than simple solutions such as gun registration laws in the US, or gun control in poor countries. There is no short-term solution to this complex problem, yet it is one of the most pressing issues for half of the world. I don’t know how to design a comprehensive approach to lower homicide rates around the world, but I do think we need a more systematic approach than focusing on local policies that treat only the symptom, but not the root cause of the problem. The first step in any solution is delineating the problem. Here it is: inequality kills. Given that murder rates, GDP per capita and Gini Coefficients are very persistent over time, figures are a fair representation of the relationships between homicides, relative income and inequality. The US only shows in the data because of the arbitrary decision to focus on countries with a rate of 5 homicides per 100,000 people or higher. The final sample consists of 69 countries. Restricting attention to to countries with a rate of at least 6 homicides per 100,000 would have reduced sample size to 62 countries, without any rich country. Good as usual. I suggest include larger graphics as links. I did it. Please check if it works. Thanks for reading and trying to improve my work!